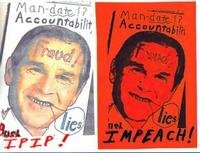 Patriotic People CARE: Bush knew all along... TAKE ACTION! Bush knew all along... TAKE ACTION! He approved of leaking classified information that brought down not just an agent but a CIA operation and front company; Brewster Jennings! Remember how he insisted that anyone in his administration, found to be involved in leaking classified information, would not remain a part of his administration?!? http://www.workingforchange.com/activism/action.cfm?itemid=20608&afccode=n39jnb Remind BU**SH** of his promise, and with this form you will be reminding your congress folks as well. You may send the letter as is, change it or add your comments.